ROOR's Pure Smoke Kulture unbleached papers are the classic 1-1/4" sized rolling papers. Each booklet comes with 50 leaves which are used for smoking legal herbs. 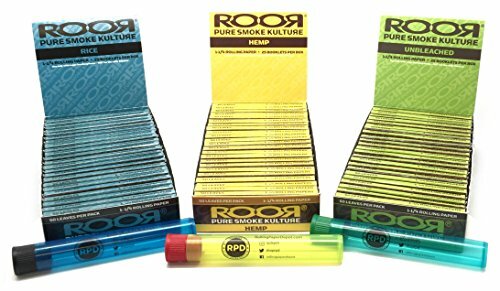 ROOR's Pure Smoke Kulture Rice papers are the classic 1-1/4" sized rolling papers. Each booklet comes with 50 leaves which are used for smoking legal herbs. These tubes are made of plastic and have a rubber top. This seals in odor and prevents lint, water, or anything else you have in your pockets from getting in. You will receive 1 tube. Color may vary. If you have any questions about this product by Roor, Rolling Paper Depot, contact us by completing and submitting the form below. If you are looking for a specif part number, please include it with your message.